Having an abortion is a momentous decision. And a growing number of states are expressing concern for women who are contemplating that choice. But while states give such solicitous attention to women planning to have an abortion, they ignore the needs of women planning to give birth. Bringing a child into the world is also a life-changing decision. Too many women have to make that choice without similar protections. It is time to demand equality and tell our legislatures to enact the Defense of Motherhood Act. Physicians would have to inform pregnant women about the risks of childbirth and motherhood. They would have to note that childbirth, compared with abortion, is roughly 14 times more likely to result in maternal death and is more often associated with depression and other forms of mental illness. They would also have to emphasize that working women in the United States can expect to see their wages drop 9 to 16 percent for each child and that having a child makes it significantly less likely that an unmarried woman will ever marry. To ensure that women are not being coerced by partners, family members or clergy into bearing a child, DOMA would require that all women be interviewed about the circumstances of conception and their motives for continuing with pregnancy. Did a husband sabotage birth control? Was a woman unable to afford contraception because her employer refused to comply with the Affordable Care Act? And, finally, pregnant women would be required to view a two-hour video featuring a colicky newborn, a toddler having a tantrum and a sulking teenager. In addition to the provisions above, DOMA would remember the special needs of pregnant teenagers. Since a child’s decision to have a baby represents a significant turning point in a young life, lawmakers across the country have required that parents give consent or be notified before a pregnant teen can receive an abortion. It is hard to understand why similar protections have not been afforded to girls who plan to give birth. After all, only about half of teen moms finish high school, and they may well rely on their parents to raise and support their babies. Therefore, under DOMA, prenatal care for a minor would not be available without at least one parent signing a statement acknowledging the limited life prospects and economic opportunities for teen mothers. Huh-HA! (Try to say it in your head like Niecy Nash as Deputy Raineesha Williams–isn’t that better?) I have only one question: Why the hell wasn’t this published on Mother’s Day? Duh! 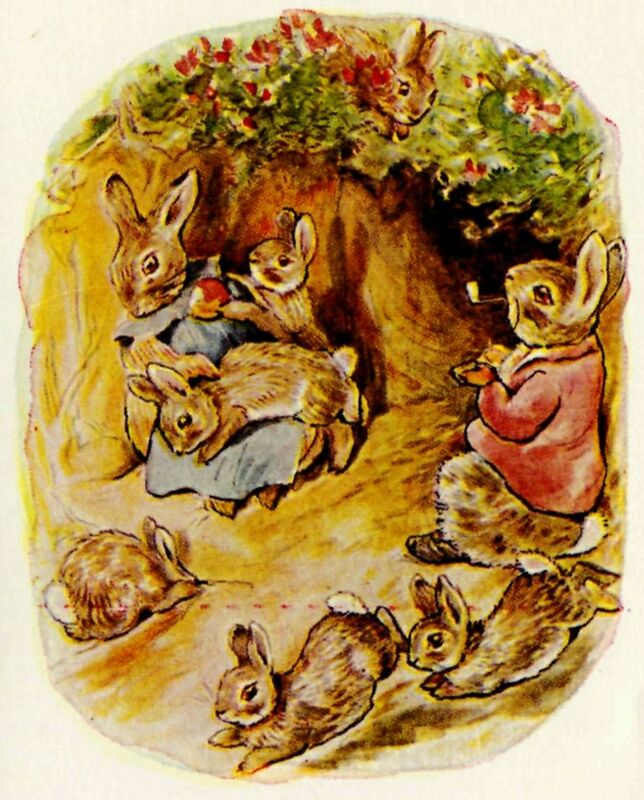 Those bunnies are great, but the “Old Woman Who Lived in a Shoe” might merit some space on the masthead too. Appeared in print in 1794, although the origin, provenance, and meaning is subject to some argument. 1794 was a famine year in Britain, the eve of an even worse famine year, and a time of social and political upheaval and conflict in which questions of class, household, population, emigration, and conjugality were being fiercely debated and politicized. It’s brilliant. Hard to argue against informed decision making (although people would). Sulking teenagers could turn everyone offe procreating!! My teenage self is a major factor in my lack of kiddes!! Ah, well–there’s always boarding school or juvie for the teens. Clearly, we should ask Child Protective Services to look in on Mother Goose & her household. Ma Barker was running some kind of a sleeper-cell in that “shoe!” They would kidnap Pitt the Younger, stuff him to the ears with moldy porridge, and try to make Parliament call off the “War on French Terrorism.” I’m a little intrigued myself, now, as some of my stuff has strayed into this neighborhood, to wonder if this is a story that gets re-written perpetually to suit the times. One version has it as being about George II, who was being accused of … I don’t know, something. There’s also supposedly a Christianized version of the rhyme in which Mrs. B. doesn’t do anything like whipping anyone soundly. A very malleable piece of culture work. Last time I looked we are progressing, with noted acceleration, from the 20th century to the 19th. Many European countries have substantial support for moms. (Cannot comment on the legal part.) Our chances of such laws are limited. Teenagers aren’t the problem. The parents are. I still hold that families and boyfriends convincing girls to be pregnant is like boys listening to the recruitment officer: The people listened to aren’t the folks doing the work, right here, right now — and if they are, they consider a young one joining them part of a dutiful hazing process. Mother’s Day and Memorial Day were connected, weren’t they? I’d say that families who are willing to care for a pregnant/postpartum daughter and her baby are in fact doing at least *some* of the work–contra the recruiting officers–but I think this is a very good point. I don’t understand why so many parents agree to essentially parent their grandchildren alongside their adult-acting but not adult-responsible children. Among middle-class families who expect their children to get at least some college, it seems like another part of the infantilization of children more generally of which I am a severe critic–that is, the desire to protect children from the consequences of their own behavior and choices at all costs. In working-class families who don’t see college as a rite of passage for their children, I think the calculations are different, and childbirth/family formation is itself the rite of passage. It’s the whole hostage-taking thing — grandparents don’t get to see their grandkids, if the parents don’t get ‘taken care of’ enough. And actual neglect makes a family’s reputation a matter for both the state and the press — that’s a big chance to take, to let fecund kids stay independent. However, for working-class families, if pregnancy’s the rite of passage, why bother to let one’s daughters go beyond basic literacy? And why the hell does that mean boys have even more license to fail, academically? They’re the ones whose paychecks will get dunned for child support, regardless of what real care they give their kids. Shouldn’t *that* outcome be prepared for? That’s why, in addition to the The Defense of Motherhood Act, we also need my modest proposal: the state-mandated purchase of pregnancy insurance by all fertile males. All those men who whine about how their “choice” is taken away when a woman they’ve impregnated won’t abort on their command will be able to stop whining — the child support will be paid by the insurance company! Of course, premiums would probably be about $3,000 per month, but reductions can be had if the policyholders turn in regular records of their use of contraceptives to lower their risk.